Hi friends! I’m writing this post from Cleveland while I’m home helping a friend through a tough loss. Her experience put things in perspective and reminded me how fragile life truly is and how important friends and family are, especially in times of tragedy. I’m working on really soaking up every moment today. In other news, I’m doing a massive website redesign right now and I’m SO EXCITED. It should be live in a couple weeks! Today I’m throwing it back to some eats from last week for a short and sweet What I Ate Wednesday starting with waffle lovin’. 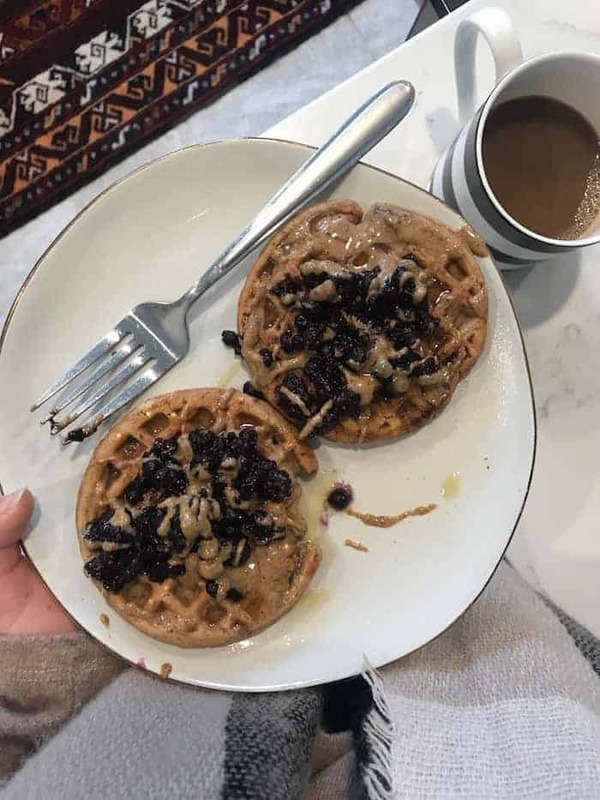 I’ve been digging Van’s waffles with almond butter, warmed frozen wild bloobs, and pure maple syrup. 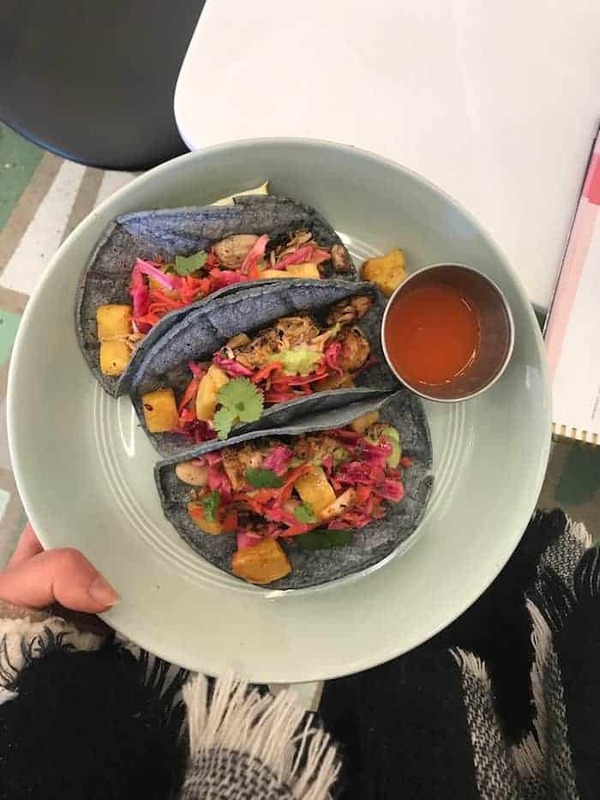 I enjoyed tacos at Alchemy Grandview for lunch with jackfruit, herbed cashew cream, cabbage slaw, charred pineapple, hot sauce, and local blue corn tortillas. One of my favorite lunches! I was craving peanut butter for a snack so I blended banana, peanut butter, cacao, chocolate plant protein, and spinach. Very satisfying. 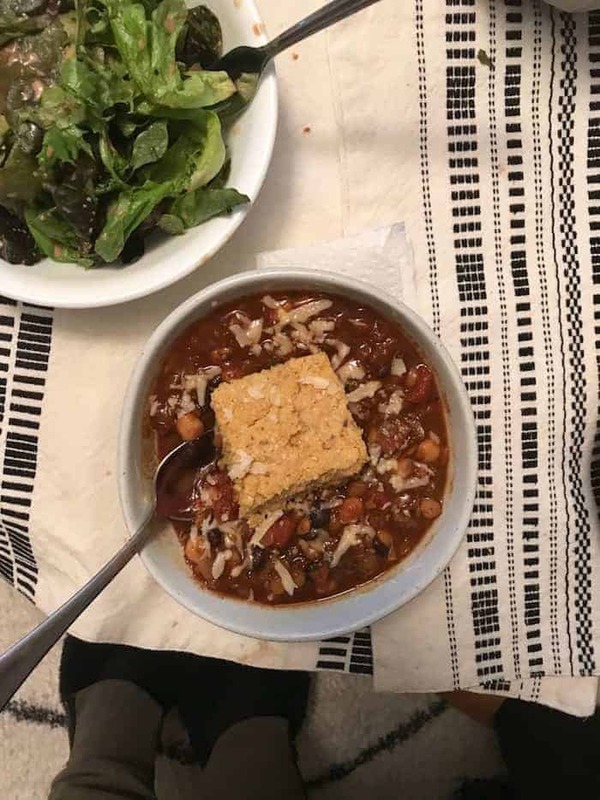 I made a big pot of hearty chili on Sunday so we had leftovers to eat for dinner on Monday. We each had a big bowl of my epic skillet cornbread (left out jalapeños and corn) plus some grated cheese. Salad with the best ever balsamic on the side! Totally hit the spot. 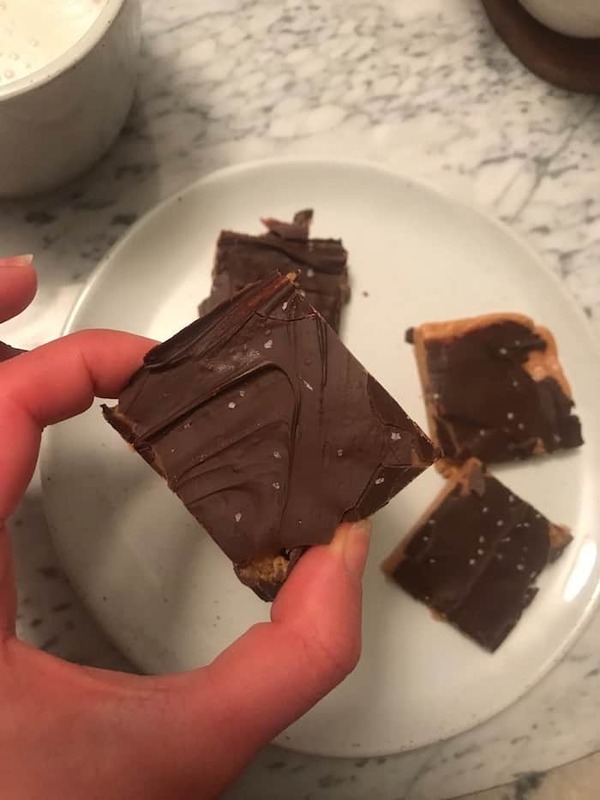 For dessert I had two chocolate peanut butter bars from a recipe I found on Instagram that were SO fabulous, even straight from the freezer. The filling was a cup of peanut butter mixed with a cup of almond flour, 1 tsp vanilla, and 1/4 tsp salt. Spread into a lined baking dish, top with melted chocolate chips, freeze, and slice! Thinking of you and your friend….loss is beyond painful and surely puts things into perspective. Thank you, Suzanne! That means a lot. I first would like to extend my condolences to your friend. I am so sorry for their loss. 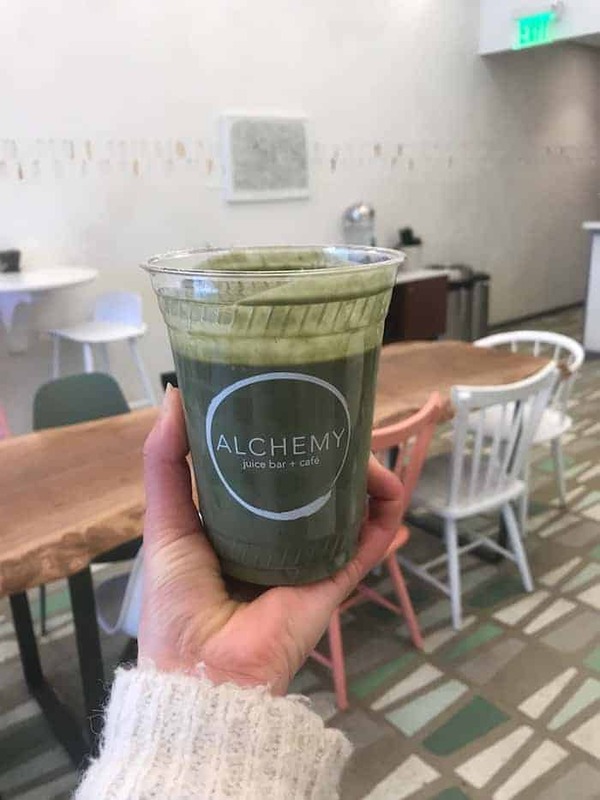 All of your food looks amazing!! This may or may not sound silly, but I love that you ate peanut butter twice in the day. One of my weird food rules years ago was having a food only once. What the heck. Not anymore, and I still love the reminder from others such as yourself! I cannot wait to make those bars! Have a fabulous Wednesday, Alexis. I’ve definitely learned to do this now because both are delicious! Unfortunately it seems to take a tragedy close to home to make us stop and appreciate what we take for granted. I’m sure your friend appreciates the support, even just big squishy hugs can be cathartic and helpful.